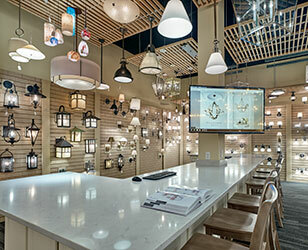 Suburban Wholesale Lighting has an onsite lighting showroom that displays fixtures made by the industry's leading residential manufacturers. We are open by appointment so our showroom staff can offer their undivided attention to each client’s specific needs. For designers, builders, contractors and their clients Suburban Wholesale Lighting provides project management services as they relate to all lighting issues from product selection to delivery to technical assistance to field personnel. No matter the size of the project Suburban Wholesale Lighting values a close relationship with each customer and is dedicated to your complete satisfaction.